The program takes a holistic approach, offering additional information and support for students, their parents, teachers, and counselors. 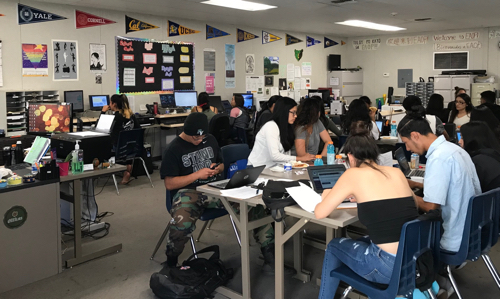 A seven-year, $9.3 million U.S. Department of Education grant will support Pajaro Valley students in pursuing their college dreams. The grant is part of the federal government’s Gaining Early Awareness and Readiness for Undergraduate Programs, called GEAR UP, which is designed to increase the number of low-income students who are prepared to enter and succeed in postsecondary education. The GEAR UP funding helps advance the center’s commitment to improve high school graduation and college-enrollment and attainment rates for low-income, first-generation college students across the Monterey Bay and Silicon Valley/San Jose regions, said EPC executive director Maria Rocha-Ruiz. further develop a college-going mindset and increase the knowledge of higher education, preparation, and financing among students and their families. As part of its GEAR UP program, the EPC will work with partner organizations Cabrillo Community College, City of Watsonville, County of Santa Cruz, Digital NEST, Food What, MAIA Foundation, Monterey Bay Aquarium, Pajaro Valley Prevention and Student Assistance, Pajaro Valley Unified School District, Santa Cruz Community Credit Union, Santa Cruz County Office of Education, Watsonville Wetlands Watch, Your Future is Our Business, and the YWCA of Watsonville. The EPC and its partners will offer services that emphasize college and career readiness and create a sustainable college-going and completion culture, work that is guided by recent research, best practices, and a unified framework of academic preparation and college and career readiness, said Rocha-Ruiz. Students will receive customized college, career, and financial aid advising; tutoring; comprehensive mentoring; services that extend and enrich the school day and year, such as summer academies; opportunities for gaining job-ready skills in high demand industry sectors; and referrals to essential college support services at their respective colleges. Parent academies and the home visit program will empower families with knowledge and skills to help them support their child’s college and career aspirations. Teachers will participate in professional development workshops that build knowledge and skills in literacy and language instruction to help all students excel in all academic areas and be prepared for college-level coursework. Counselors and teachers will partake in professional development that build their capacity to support students’ college aspirations and preparation for college and careers. Collectively, these services are meant to lead to increased rates of four-year college eligibility; rigorous and advanced courses completion; high school graduation; and college enrollment and completion. The EPC, a program of the UC Santa Cruz Division of Undergraduate Education, currently oversees two other GEAR UP programs: one in South Monterey County and another in the Monterey Peninsula Unified School District. The Educational Partnership Center coordinates student academic preparation efforts of UC Santa Cruz with the goal of increasing access and opportunity to postsecondary education for students across the Monterey Bay and Silicon Valley/San Jose regions. Through ten vital programs (EAOP, MESA, COSMOS, Cal-SOAP, GEAR UP, SIP, GIE, Educational Talent Search, Girls Paving the Way and the California Reading and Literature Project), and with support from federal, state and foundation funding, EPC provides an array of direct services which support students on the college-going pathway through tutoring, mentoring, academic and career planning and counseling, leadership training, test preparation, college and career awareness and enrichment, and teacher professional development.